This is the first post of what we hope to be a series, where we try to summarize and explain what happened at Polymorph during the past week. For this one, I interviewed @frankiezafe and asked him about the development of the different projects at Polymorph. Peel is the code name for the first game developped inside Polymorph. François was working on this project since a while and started with a first concept, which gave it its name. As portrayed in this video, the idea was to solve a puzzle, to find your way through a labyrinth by peeling a 3D sculpture. 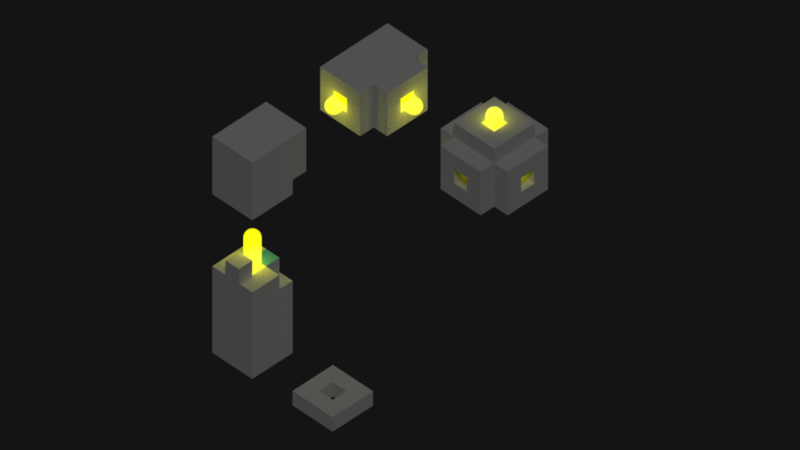 This concept came after a workshop François gave about Three.js. If you’ve followed some posts from this week, the concept is evolving into something completely new and different. 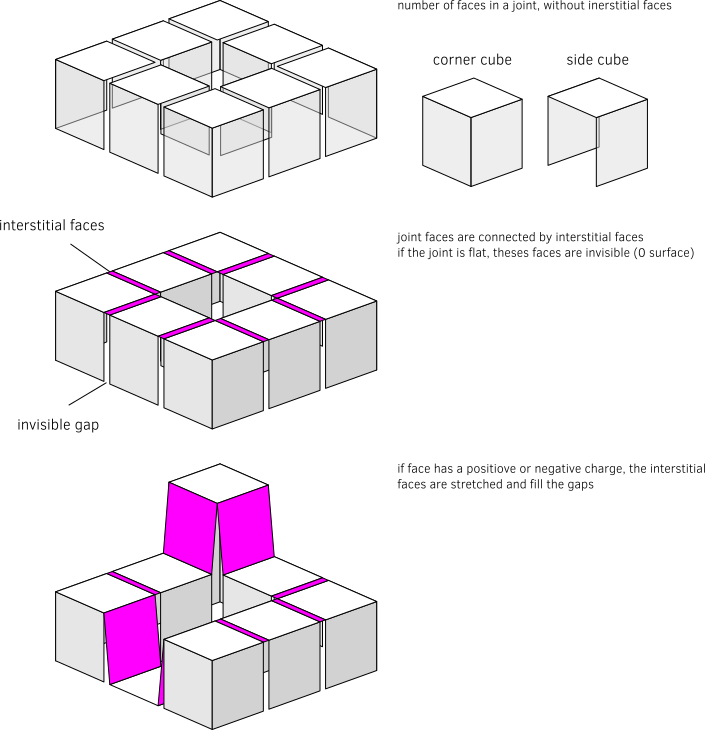 The name is kept, but the principles have evolved into a different game, one where the player has to assemble different 3D pieces in order to solve a puzzle. Since this is going to be the first game published by Polymoph, Francois is looking for something more interesting in terms of gameplay than just a little project that you would discard after 2 minutes. The goal behind PEEL is to test the workflow and the tools, but not only. The purpose of Polymorph is to also test new gameplays and new approaches in game design, this is why PEEL had to evolve in something more challenging, more interesting. The inner workings of the game are now more complicated and hard to put into words. So Francois is laying his ideas into schemas and graphics, both as a way to express them but also possibly ease the work of programming it afterwards. Let’s see how that evolves over the next weeks. 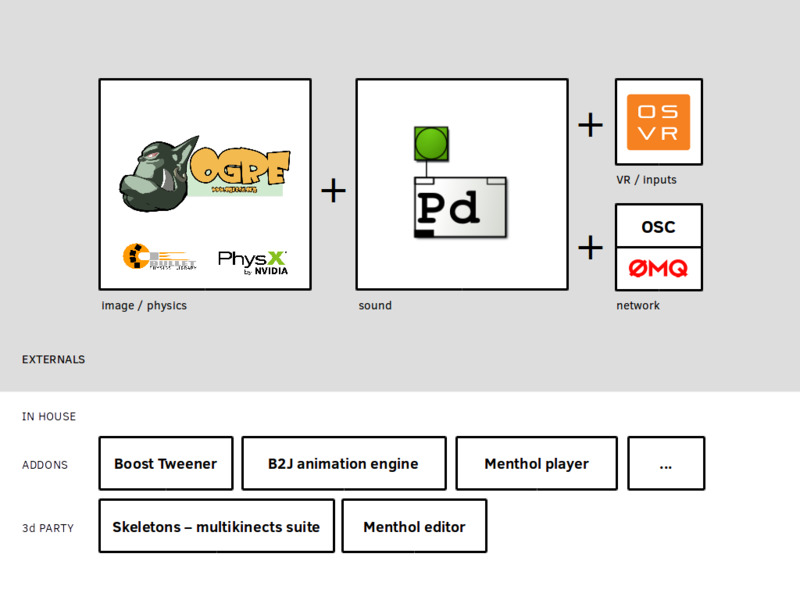 What we call the Polymorph Engine is an assembly of different tools, with at its core, the open source 3D engine called Ogre. Every monday, the dev team of Polymorph meets to discuss the tasks and needs to achieve compilation and running examples of Ogre on all the operating systems possible. Taking OpenFrameworks as an example, the Polymorph Engine would be Ogre and some other components nicely packaged so that a game developer could easily start working on projects without having to recompile Ogre each time. The same way you just clone an empty example from OpenFrameworks to start working on your next digital art project, with Polymorph Engine, you would copy the basic default empty example and start coding and testing your project from there. This means that the compilation of Ogre would only be done once, most certainly just after downloading the latest version of the Polymorph Engine. Then just the example you are working on would be compiled each time some code is changed. So far, Francois had achieved compilation of Ogre 1.9 on Linux and even published a tutorial for those who would like to try it also. But the dev team of Polymorph has decided to use Ogre 2.0 for the Polymorph Engine and this is much much less documented than the previous versions of Ogre. Work needs to be done in that sense, to document and ease that process. During the past week, Peter has managed to compile Ogre 2.0 for Android and Debian and also compiled the first examples that come with it (aka. the Purple Screen of Joy aka “Yes, it’s working”). @balt has also managed to compile Ogre 2.0 for Linux Mint and has investigated into build farm software to automate compilation on different platforms. By the end of next week, we expect to have Polymorph Engine working as it should (Ogre + an empty example to be copied) for Linux. The whole Polymorph team working exclusively on Linux machines, this is priority in terms of platform so that game designers can start implementing their ideas. Compilation of Polymorph Engine will also be tested on Windows 10.0. And François will take some time off from game development because he will teach Blender for the whole week at the summer workshops of iMAL. Don’t hesitate to join him if you’re interested, there might be some seat left. If you found this post interesting or want to follow Polymorph’s activities, don’t hesitate to subscribe to our RSS feed or our Twitter account. Don’t hesitate to leave us comments, ask us questions and, of course, forward this to those who might be interested.